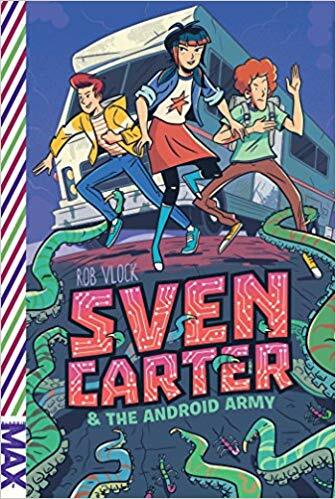 Rob Vlock is a Middle Grade author with two middle grade novels published with Simon & Schuster, Sven Carter & The Trashmouth Effect and Sven Carter & The Android Army. What inspired you to write Sven Carter? I’ve always had kind of a fascination with the outsider in literature (which probably explains why I was so into Kafka in college). I also love characters like Harry Potter and Percy Jackson who discover something profoundly important about themselves and have to react to this newfound information. So I decided to combine these themes in Sven Carter. Instead of uncovering something wonderful about himself (for example, that he’s really a great wizard or a demigod), Sven discovers the worst imaginable thing—he’s an android programmed to destroy everyone he knows and loves. Exploring what a good kid would do when his very existence could usher in the extinction of humanity was really exciting for me. It’s the ultimate conundrum. And seeing how Sven responded to it while I was writing his story was so gratifying! I hope everyone who read my books feels the same!